We continue our current series, "Turning Toward Life" throughout Lent, concluding on Palm Sunday with "Shouts of Joy!" Join us as we continue our time preparation and commitment, for longing and anticipation... this time of turning toward life! We celebrate the parable of the Prodigal Son in worship this Sunday. We celebrate that each of us is represented (in some way and at some point in our lives) by each of the characters in the story. We celebrate that no matter if we are "good", "bad" or "ugly", our reconciling God is here, welcoming us home with open arms. Join us for worship this week and receive your, well deserved, God hug! Rummage Sale - THIS WEEKEND! 10 - 11:30 a.m. Childcare is offered for infants and toddlers every Sunday morning. It's finally here - the Rummage Sale you've all been waiting for! Come down early and come down often. As always, there are treasures galore and all kinda of jewelry! We are celebrating the amazing work done by the United Methodist Committee on Relief this Sunday! This one-time per year offering goes directly to UMCOR to support their organizational infrastructure so that all other donations throughout the year go 100% to the declared emergency. 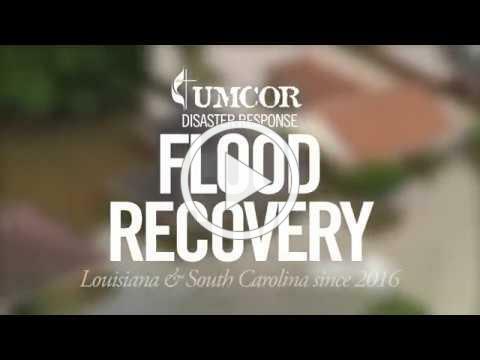 UMCOR is currently working around the world to help alleviate the devastation of Cyclone Idai in Africa and, here at home, the disastrous flooding in Iowa and the mid-west. Please prayerfully consider giving to this worthy cause this Sunday. New Saturday Evening Worship for Lent: Soup and Spirit! Saturdays, April 6th, 13th & 20th, 2019, 6 p.m.
As we make the journey through Lent this year, we are turning towards life by turning towards each other for body and soul nourishment every Saturday night at a new evening worship called "Soup and Spirit" led by Pastor Alyssa throughout the season of Lent. Relaxed and informal, we'll have time to get to know each other in greater depth and explore sections of scripture as we share our thoughts and lives on a weekly basis. This is an evening worship time for all ages where all voices are welcomed and all appetites are filled. We'll begin the evenings with a short prayer, fill our bowls with delicious soup, then talk about our experiences in relation to the passage for the night with those at our table. Whether you can make it for every gathering or just one or two, please join us for this time of community building and sharing together. RSVP to the Morningside office during the week so they plan plenty of soup! Morningside UMC is looking for a musician to play piano and/or guitar for the Face to Face Worship Service here at Morningside Sunday mornings at 8:30 AM. The service lasts from 30 to 45 minutes and includes 2-3 contemporary hymns. There is a small stipend available and the position would be perfect for a student living locally or home for the summer. If you are interested or know someone who is, please contact Pastor Wendy. Sprucing up the Morningside UMC landscape, enjoying fellowship with other volunteers and making the place shine for Easter... the Trustees are looking for volunteers to help do some outdoor clean-up on Saturday morning, April 13th. Bring your gloves and come join in the fun and fresh air! "Walking Together After General Conference"
We are honored to be hosting the upcoming Reconciling United Methodists meeting on April 13th here at Morningside. This is a wonderful opportunity to be in fellowship with reconciling United Methodists from throughout our conference. Do miss the chance to attend this meeting in our own "backyard!" 10:30 am - "Walking Together After General Conference"
We will reflect on the experience of General Conference and its impact on our Oregon-Idaho Annual Conference. Following the themes of Brian McLaren's book We Make the Road by Walking, we will continue the quest for spiritual formation, re-orientation and activation. 1 pm - Stay for a conversation about "WHAT'S NEXT?" We will look toward the Oregon-Idaho Annual Conference June 12-15 in Eugene and the year to come. See You in Salem at Morningside UMC! Vickie was a member at Englewood UMC for 27 years and was honored to serve as their Ad Council chair and their representative to the Open Door Churches board. She recently retired, after 27 years, from the Salem Keizer school district. She loved her job and worked with students with true learning disabilities. "There is nothing more gratifying than witnessing a third grader functioning at first grade level successfully reading a grade level book. It is just the Best!" Sam is retired clergy who was originally ordained in the Disciples of Church faith and then moved to the United Methodist Church. He preached for more than 40 years and retired in 2011. While he will be keeping his credentials with the Virginia UMC Conference for now, Nancy is pleased to be joining Morningside UMC at this time. Nancy joins Morningside transferring her membership from Wesley UMC in Hampton, VA. She worked for the City of Newport News VA for 29 years as an analyst with the Fire and Public Works Departments, then as a Water Resources Planner with the Water Department. Nancy and Sam have 4 children and 7 grandchildren between them. They moved to Oregon this passed August to be near Nancy's son and his 3 boys, and closer to Sam's daughter and family in California. They have a daughter and family in Roanoke, VA, and a son in FL. Nancy and Sam share,"We are pleased to be part of Morningside UMC!" Vicki and Norm have been friends of Morningside for a couple of years. Although joining by profession of faith, they are life-long Methodists and were most recently members of St. Mark's UMC in Sacramento. Vicki has worked as Morningside's Communications Administrator for almost a year and a half now and loves the opportunity to use and hone her creative skills in the position. She retired from Hewlett Packard as a business analyst and supply chain manager in 2005 and went into business with her mother as a Licensed Fiduciary in the San Francisco Bay Area until she and Norm moved to Salem in 2016. Norm and Vicki have two daughters, Briana, who lives in upstate NY, and Samantha, who lives in the Los Angeles area. "We love the open and welcoming family here at Morningside and look forward to getting to know everyone!" Who doesn't need their batteries recharged? We all do from time-to-time! We are blessed to have United Methodist resources devoted to creating quality environments of Christian hospitality and learning experiences to help provide us the recharging we need! Volunteers needed to bake casseroles for Easter Brunch! CLICK HERE to sign up. CLICK HERE to print the sign-up form. Complete the form and turn it in to Jeff at Youth Group! The Open Door Churches Young Adult Group is made up of college students and young professionals ranging in age from 18-29 who are exploring questions of faith together. The group meets every Wednesday evening from 7-8:30, usually at IKE Box. Please look at our Facebook page for specific dates, times, and places. Thank you for your continued support of The Open Door Young Adults. Please contact Pastor Alyssa at alyssabaker08@gmail.com with any questions. Our spot has been reserved and we are making plans now for the annual Church Retreat Day! Dust off you camping chairs, your canoes and ukuleles... Mark you calendars and plan to join in the fun. Worship, pot-luck brunch, crafts, games, outdoor activities, BBQ, glorious setting and wonderful fellowship! April Activities Calendar - What's Happening at Morningside?